I interrupt this regularly scheduled “Weekly Roundup” post to share and reflect on something far more important today than funny things I found around the internet. Truthfully, I’ve been too busy packing, shipping, selling furniture, hugging friends goodbye, scheduling a few posts, and preparing ourselves for tomorrow’s departure to really do much surfing on the web this week. But I do have time to stop and celebrate our five year anniversary. Five years ago today (although, then it was a Saturday,) I anxiously put on a dress, fell into sat down in my dad’s cherry red ’67 Chevelle, and watched as five classic cars ahead of us pulled into the driveway of my childhood home. Six of my closest friends in powder blue dresses proceeded me in climbing out of their cars and walking up the makeshift aisle between rows of white chairs that filled the front lawn of my childhood home, and I eagerly followed them behind the crowd until it was my turn. I don’t remember the music that was playing or which faces were watching me as I walked that aisle with my Daddy, but I do remember the look on Dan’s face, smiling in his bowtie, the one thing he was determined to have a say in as we’d planned the day. Many of our best guy friends stood to his left, handsome as ever in their matching bowties. I glanced up and noticed that one of the window shades in my brother’s room had been pulled down, the front of our house winking at us in all of our pictures forever. 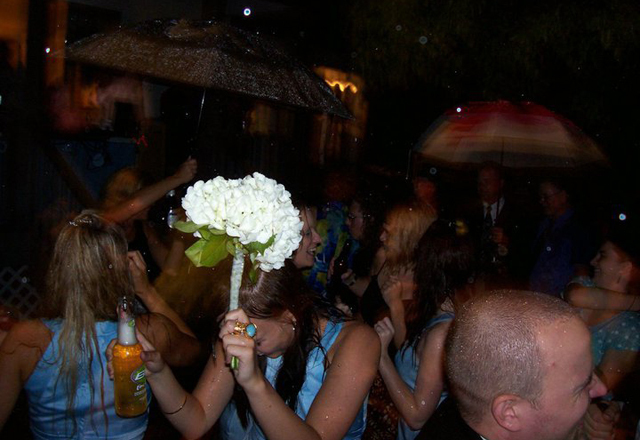 My little cousin Amy repeatedly dumped and collected the rest of her flower petals behind me as we said our vows. One giant drop of rain landed squarely on my bare shoulder. Please, God, just a few more minutes before that, will you? We said “I do,” kissing and smiling and turning to take in the happy faces of all of our guests, all of them practically family. My grandmother, parents, and new in-laws beamed from the front rows. I forgot my bouquet of blue hydrangeas as we retreated towards the back, my little cousin Sarah panicking momentarily that I had left them in her care. We drug our formals through knee-high grasses to pose for photos with our wedding party and best friends. After being announced to our guests in the back yard, we danced our first dance as husband and wife while a family friend performed Anberlin’s “Inevitable“ on his acoustic guitar. The bottom finally fell out, sending our guests running for cover under the tent where our food was protected. We smashed cupcakes in each others’ faces, toasted with Champagne, and hid our faces with embarrassment as our friends gave speeches recounting some of our favorite memories. Dan’s sister Rochelle decided that the rain wasn’t going to ruin the night, and within minutes a dance party in the rain had broken out on the patio in front of our DJ. Some guests left, but many stayed and join in. When you’re never going to wear a dress again, you can be sentimental and throw a fit over the rain, or you can choose not to care if it becomes soaked and dirty and have the time of your life. We danced and sang and had the best time ever in the pouring rain. Wine and beer bottles became slippery and were dropped and smashed on the slate patio, cutting a couple of feet in the process, but that didn’t stop my friends from dancing; glass was swept away and the music never stopped. “Don’t Stop Believn‘” became the night’s anthem, singing along through the rain while tuxes and dresses dripped and dyed shoes ran color across the slate. We finally announced our exit and piled into our getaway car, exhausted and anxious for the two three(?! < because, rain) hour drive back to our townhouse so we wouldn’t miss our 7am flight the next morning. 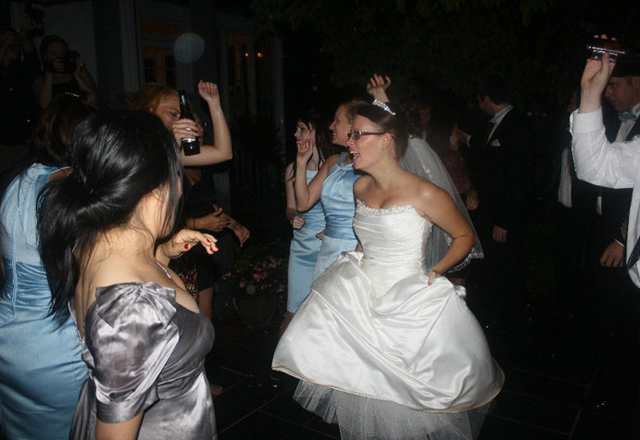 Our friends and family continued dancing late into the night; with only one neighboring home in sight (whose family was in attendance,) there was no one around for miles to complain about the noise. The next day my family returned soaking wet tuxes to the rental place, one shoe—to this day—still unaccounted for. So much has changed in the eight years that Dan and I have been together, especially these past five years. I absolutely know him and love him more than I did the day we got married, even more so than I did just one year ago. Love continues to grow and grow, and we continue to grow together. I am so very grateful for my best friend and that we can experience all of life and life’s changes together. Tomorrow we leave California. I think it’s quite fitting that we’re starting our 6th year out just as we’re also starting this new chapter in our lives. The first five years were amazing. Here’s hoping the next five, and on, are just as wonderful! I have no doubt they will be. Oh my gosh, I love SO much that you got married at your childhood home! (And love that the window shade was down – so sweet.) 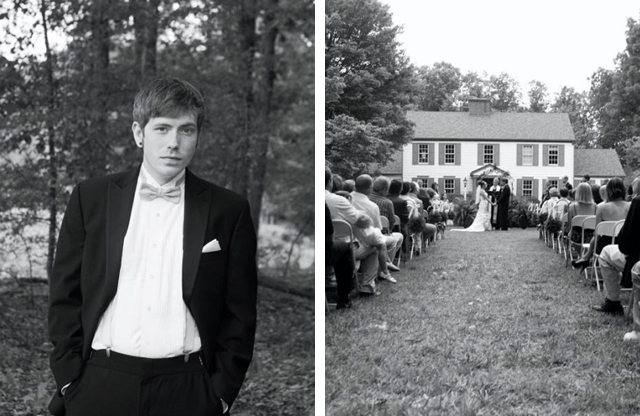 Christian and I got married at my parents’ house too and it’s so special! Your day sounds perfect! !